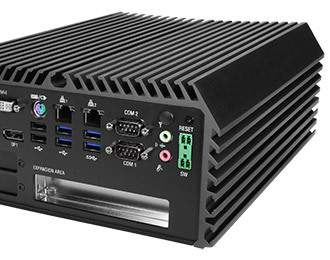 Rugged, industrial design with expandable I/O and 6th generation Intel Skylake processing. Tackle any task with the DS-1101, a compact powerhouse harnessing the power of Intel Skylake desktop processors up to Core i7 and support for up to 32 GB of memory. The Q170 chipset provides support for advanced technology such as vPro and virtualization and optional 4G LTE connectivity enables remote network access for in-vehicle installations or failover protection. Designed to operate in the harshest industrial settings where other systems would fail, the DS-1101 can perform in any environment that requires highly capable computing. Encased in a rugged, fanless, ventless, and cableless enclosure, the DS-1101 easily withstands dirt, dust, shock and vibration. A wide temperature range of -40°C to 70°C and input voltage of 9~48 V ensures long-lasting reliability even in the most extreme environments. The DS-1101 comes equipped with two Gbe LAN ports and two RS-232/422/485 COM ports for connectivity to a wide range of peripherals and equipment while a 2.5” hot-swap HDD bay provides additional easy to access storage. 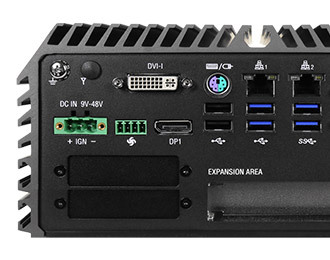 I/O connectivity is just one of many areas where the DS-1101 shines, equipped with 8 USB ports (Including 6 USB 3.0 ports), in conjunction with two DisplayPort connectors and DVI-I which allows triple HD displays. The DS-1101 offers an incredible array of expansion possibilities including additional COM, DIO, LAN, PoE, and USB, as well as riser card options for PCI and PCIe x16. 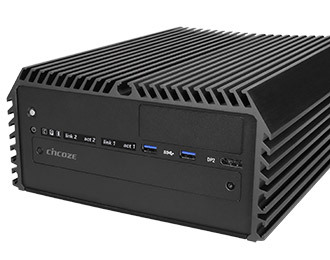 8.94" x 4.25" x 10.28"
This system supports Microsoft Windows Server 2008 R2 and Windows Server 2012 R2. For project needs, please contact us.